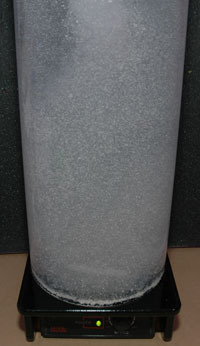 A Kalk reactor is a great way to keep Calcium levels up in your reef tank. 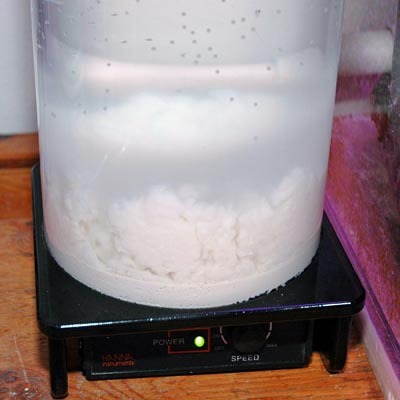 Depending on your bio load and water usage, you will need to open the unit and add more Kalk every few weeks to every few months. A good source of Kalk powder is 'Ms. Wages Pickling Lime' from the grocery store. 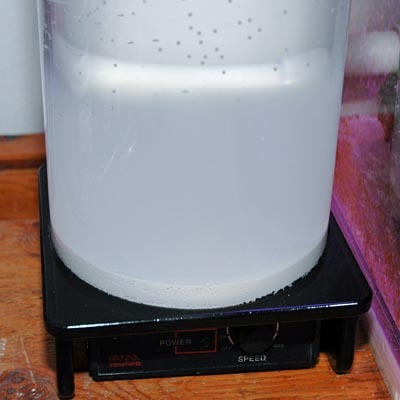 These units use a magnetic stirrer, so there is no wear on an impeller like pump based models. 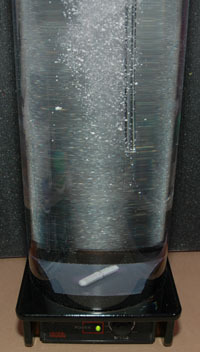 The Kalk reactor takes fresh water and mixes it up with Calcium Hydroxide to make a saturated solution. This solution is then dripped in to your tank as your sole source of make-up water. The calcium in this solution is critical for the strong growth of stony corals, clams, and other critters that use the calcium for building shells and skeletons. 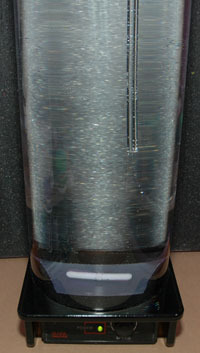 Units come complete with the Magnetic stirrer, 1/4" speed-fit connections, and the twist-lock cap. Each unit uses a low-profile UHMW pad at the bottom of the chamber, that should never need replacing, although replacement pads are available. 6" dia. 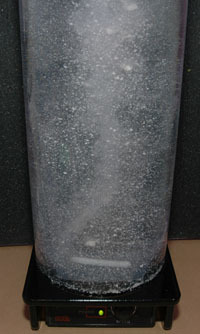 Reaction chamber holds more Kalk for better mixing, and a longer time between refills (8" on KR3021). Speed-fit 1/4" inlet/outlet matches up to standard RO/DI plumbing. No adapters needed. Adjustable stirrer RPMs, from 100 to 1000 revolutions per minute. Internal Speedsafetm mechanism ensures that the maximum safe speed for the stirrer is never exceeded. Supplied complete with a 50mm long, Teflon® coated magnetic stir bar. New twist-lock cap for quick refills. Includes 6' of 1/4" black RO/DI line. Requires a dosing pump or solenoid/float switch for typical use. 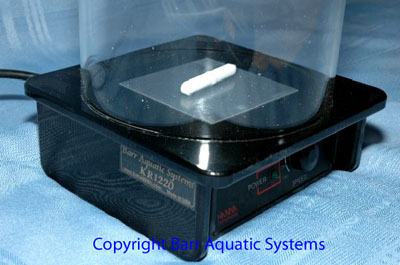 The KR3021 features an extra large stainless steel magnetic stirrer. Use RO/DI water with reef systems if possible. Plumb the unit between the water source and the sump so that all make-up water flows though the unit. Do not restrict the output in any way. 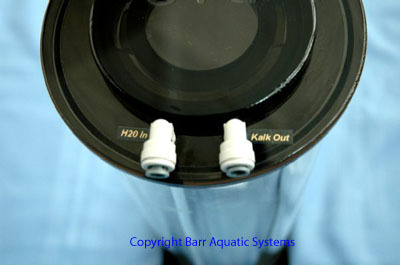 Do NOT attach directly to a mechanical float valve, as this will backpressure the unit and cause leaks over time. Use a dosing pump, or solenoid and sensor to control the water level in your sump, or use a gravity feed from a storage tank higher than the unit. 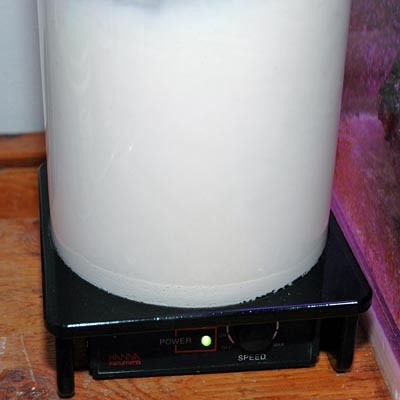 Install a lamp timer on the stirrer so that it runs 2-4 times a day, for 1-5 minutes each time. Do not run the stirrer 24 hours a day, use a timer. During normal use, the stirrer system and wear pad should last for many years. Filling up: Twist the cap 1/4 turn and remove. Spoon in more Kalk powder with a Teaspoon. Twist-lock the cap back on and you are done! No messing with the plumbing lines just to refill. Speedsafetm is a registered Trademark of "Hanna Instruments" and Teflon® is a registered Trademark of "du Pont de Nemours & Co."